Combine flour, baking powder, sugar, and salt and set aside. Beat eggs and milk together in another measuring cup, then stir in cooled melted butter until combined. Pour wet ingredients into dry and stir just until combined (it should look a little lumpy). Heat pan over medium heat and add enough butter to coat well. Pour batter onto pan in small circles; if using, sprinkle with chocolate chips. Cook until their tops bubble and bottoms turn golden brown, approx. 1 – 2 min. Flip pancake and cook for approx. 30 more sec. If needed, add more butter and adjust heat as you go to prevent sticking or burning. Serve immediately. 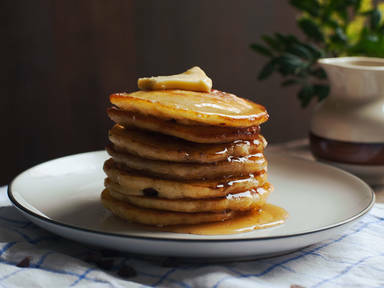 Enjoy with more butter and a drizzle of maple syrup.